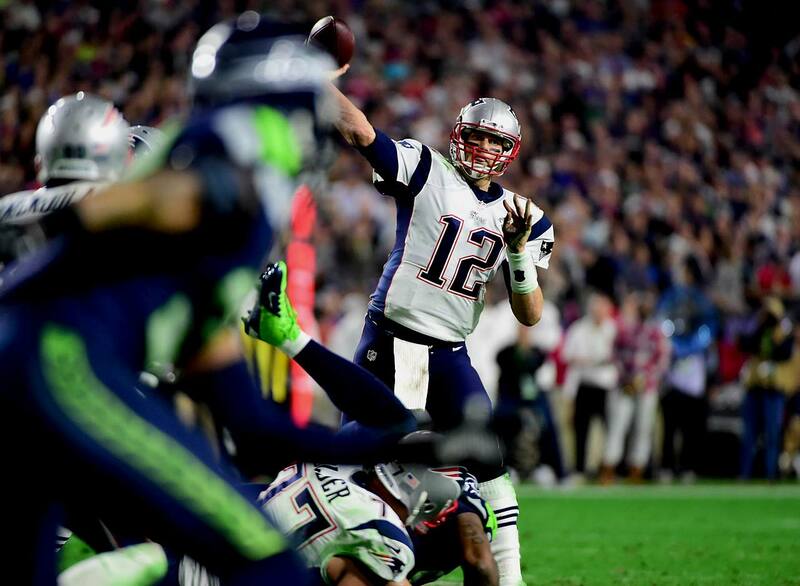 New England Patriots wide receiver Brandon LaFell said he hoped that the coaches would let the Seattle Seahawks score on purpose during the final minute of Super Bowl XLIX so that New England’s offense could get the ball back with plenty of time to score. After Russell Wilson completed a 33-yard pass to Jermaine Kearse, Seattle called timeout with 1:06 left and the ball on the five-yard-line. 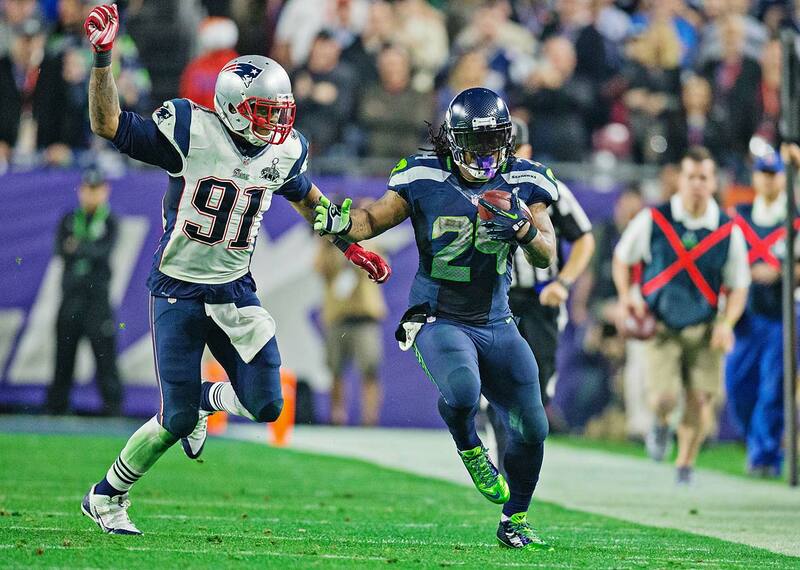 Marshawn Lynch then picked up a gain of four yards to move the Seahawks to the one-yard line. 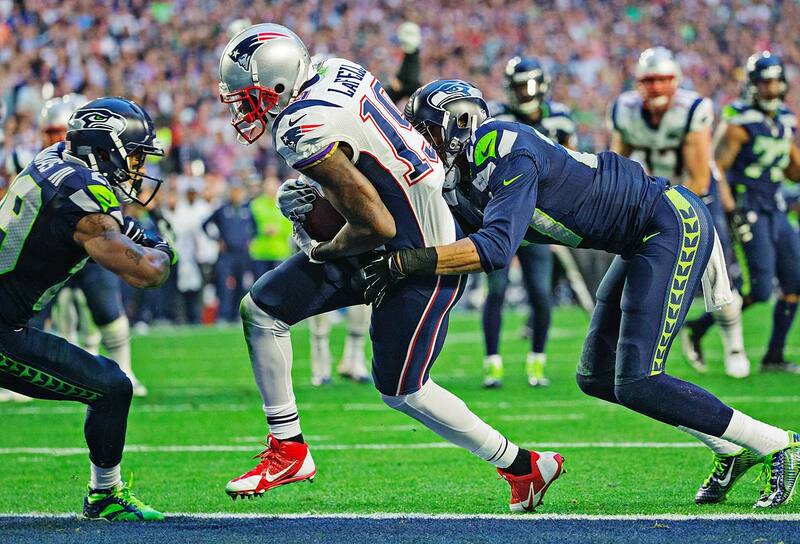 "Once [Jermaine Kearse] caught the ball, I was just like I hope the coaches let 'em score," LaFell said on NFL Network's NFL AM. "Let 'em score so we can get the ball back, leaves 50, 40 seconds; they haven't been able to stop us the whole fourth quarter." 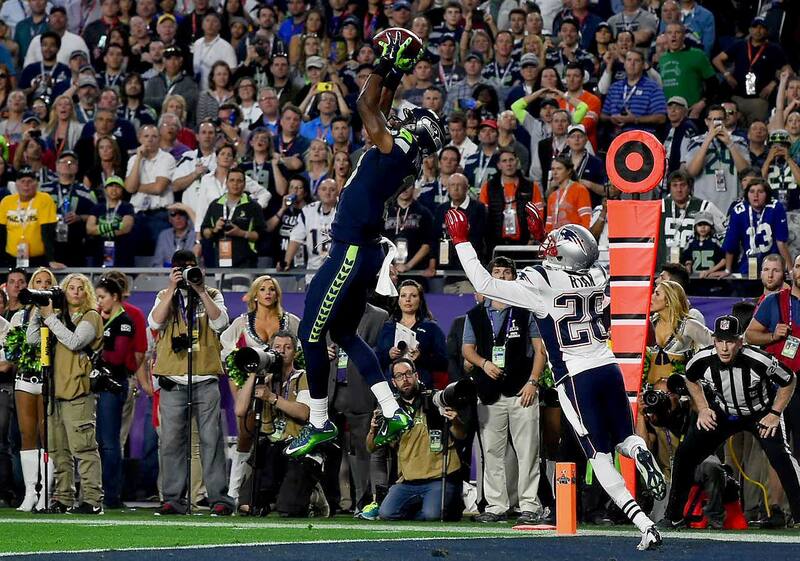 Malcolm Butler intercepts a pass intended for Richardo Lockette to prevent the Seahawks from scoring a would-be winning touchdown in the final minute. 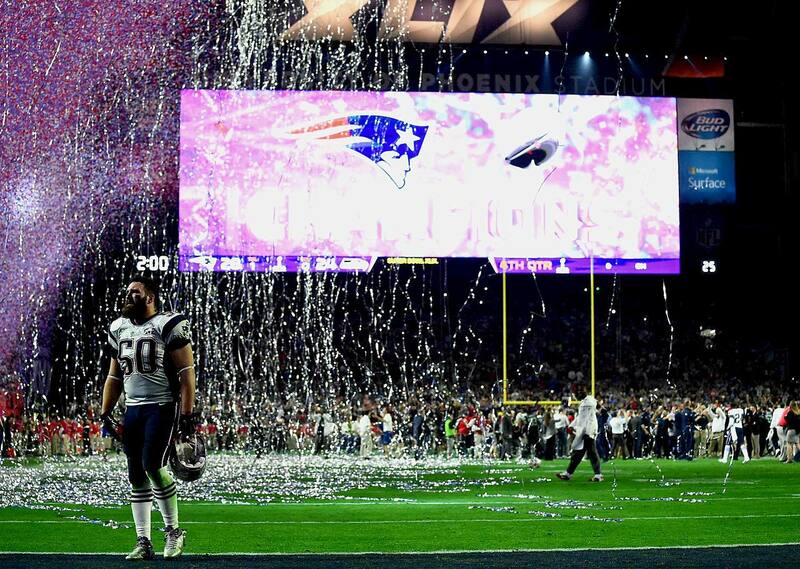 Malcolm Butler's first career interception gave the Patriots their fourth Super Bowl victory in the past 14 years. 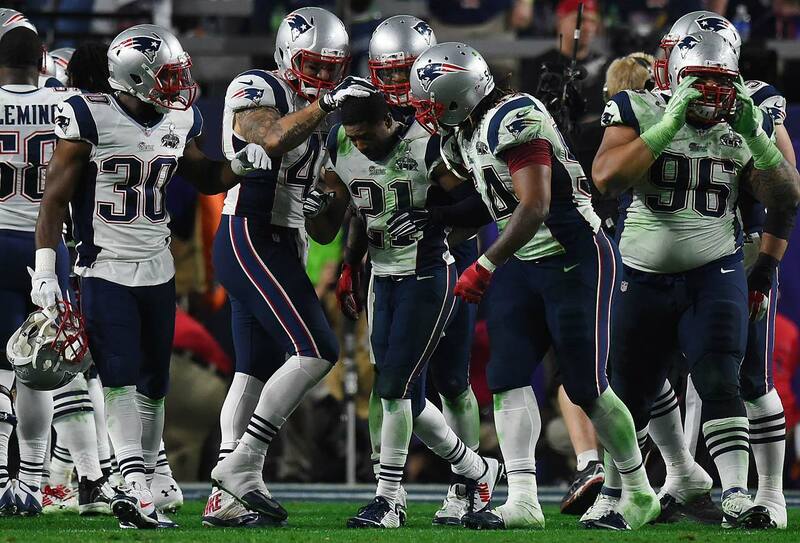 Butler's teammates congratulate him for making the game-saving pickoff on a second-and-goal play from the one. 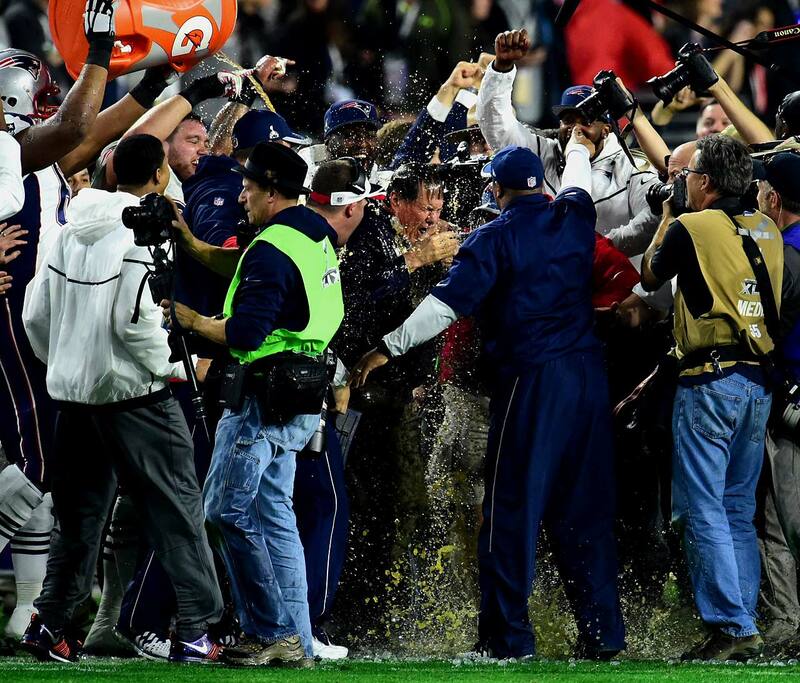 New England coach Bill Belichick gets a Gatorade bath. 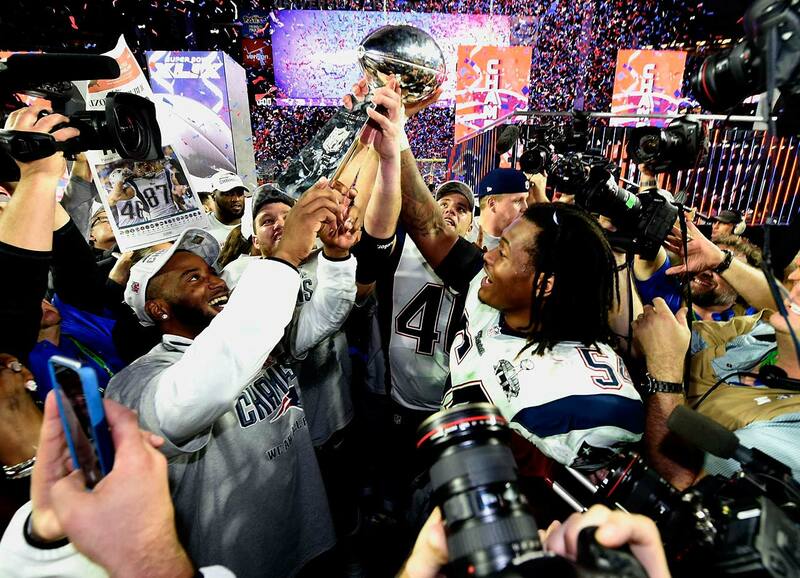 The Patriots celebrate their thrilling last-minute victory. 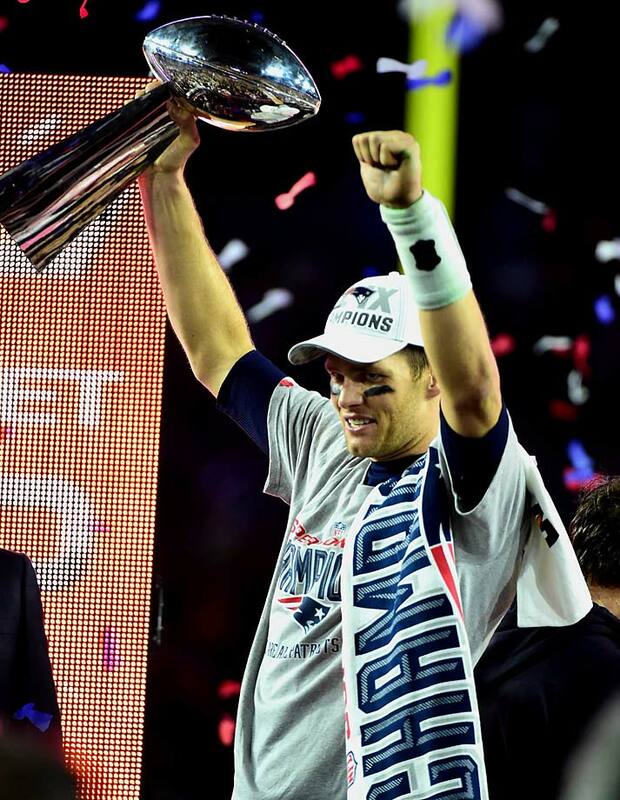 A victorious Tom Brady was named the game's MVP. 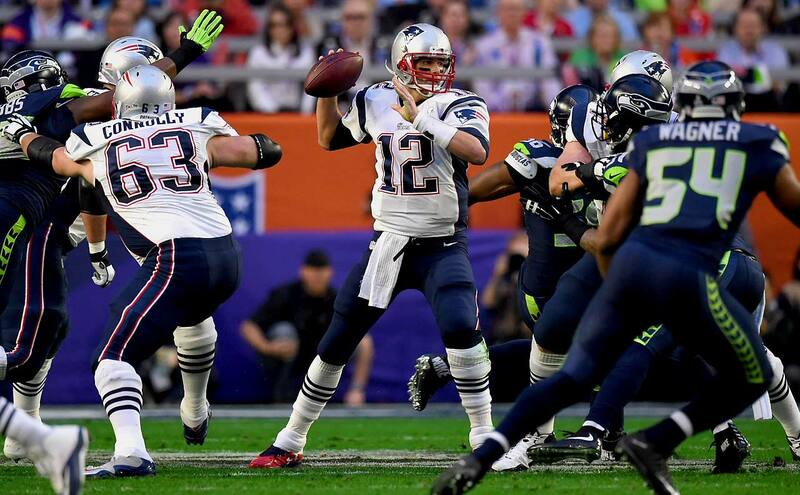 Tom Brady put the Patriots up 28-24 with this three-yard touchdown pass to Julian Edeman with 2:02 remaining. 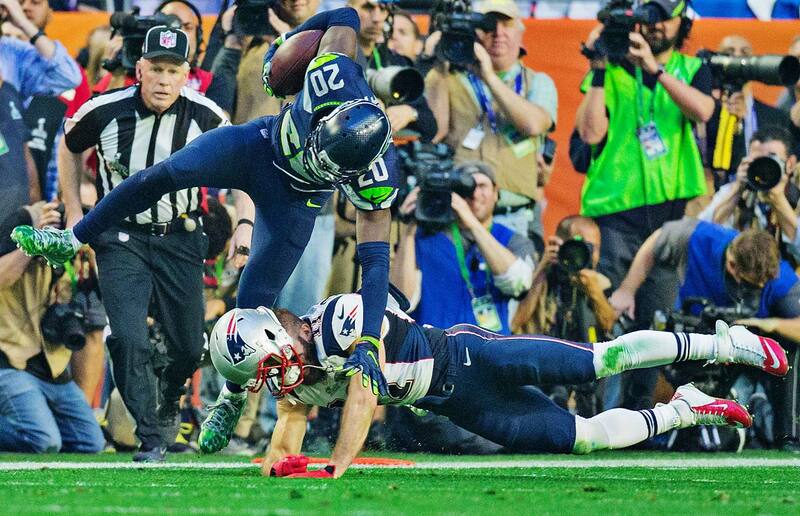 Julian Edelman was a thorn in the Seahawks' side all night, catching nine passes for 109 yards and the game-winning touchdown. After falling behind by four in the fourth quarter, Seattle got a 31-yard pass to Marshawn Lynch to get into Patriots territory. 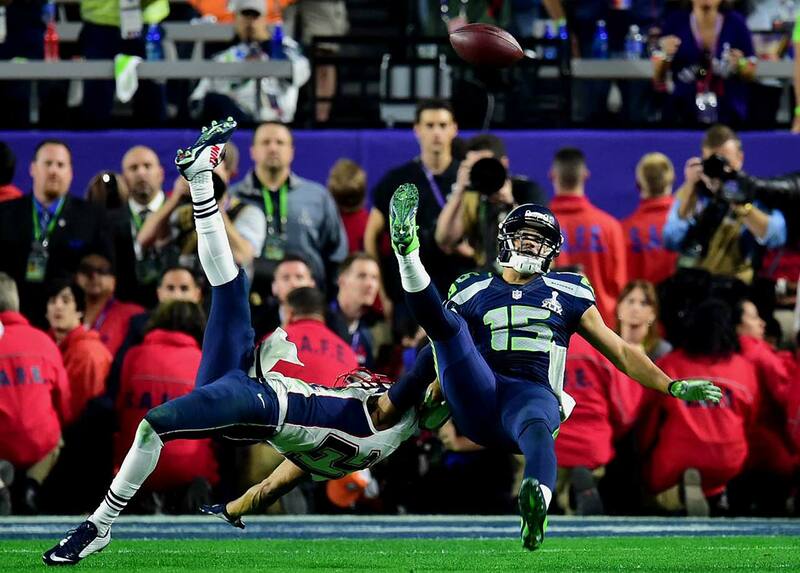 Just as the New York Giants got a miraculous catch by David Tyree in their Super Bowl upset of New England, Seattle got one from Jermaine Kearse that gave the Seahawks first-and-goal at the five with a little over a minute to go. 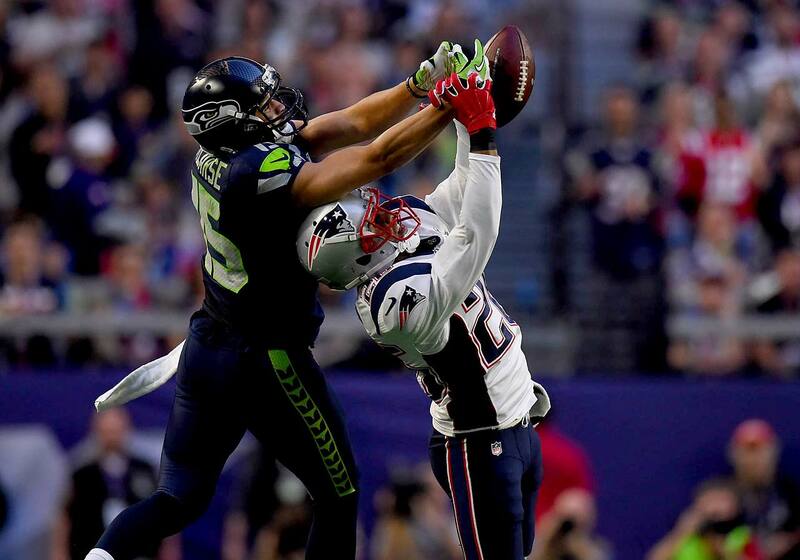 Kearse kept his eye on the ball and batted it around three times before pulling it in. 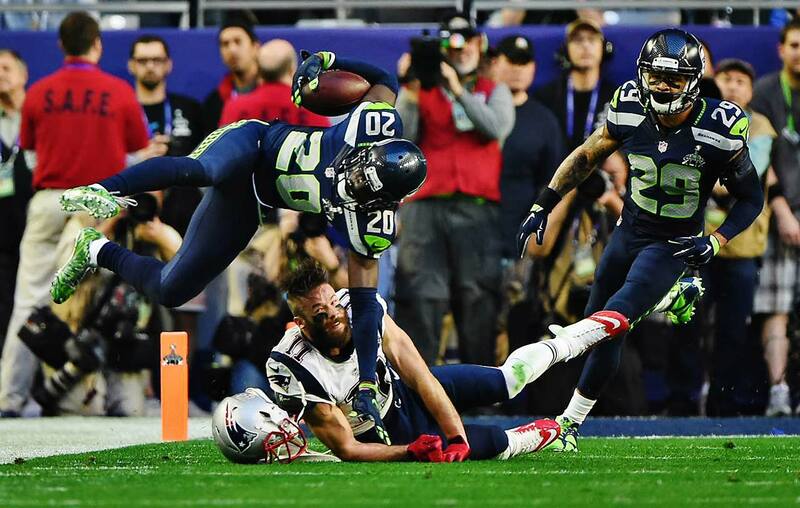 Super Bowl hero Malcolm Butler was the defender covering Kearse on this 33-yard completion. 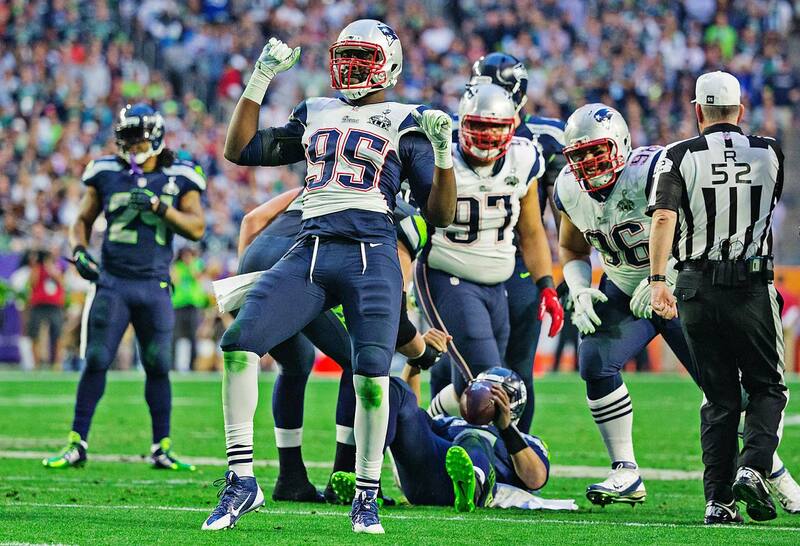 Chandler Jones celebrates one of the three sacks of Russell Wilson. 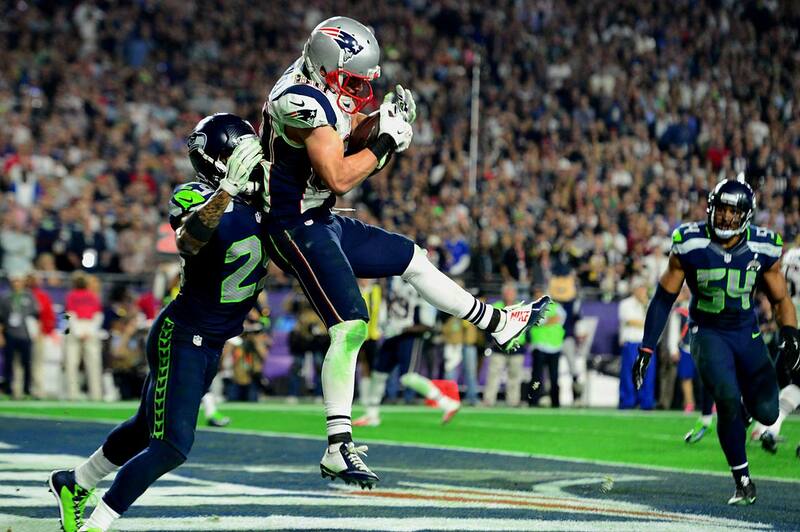 Danny Amendola scores on a four-yard touchdown to pull New England to within three points of the Seahawks, 24-21. 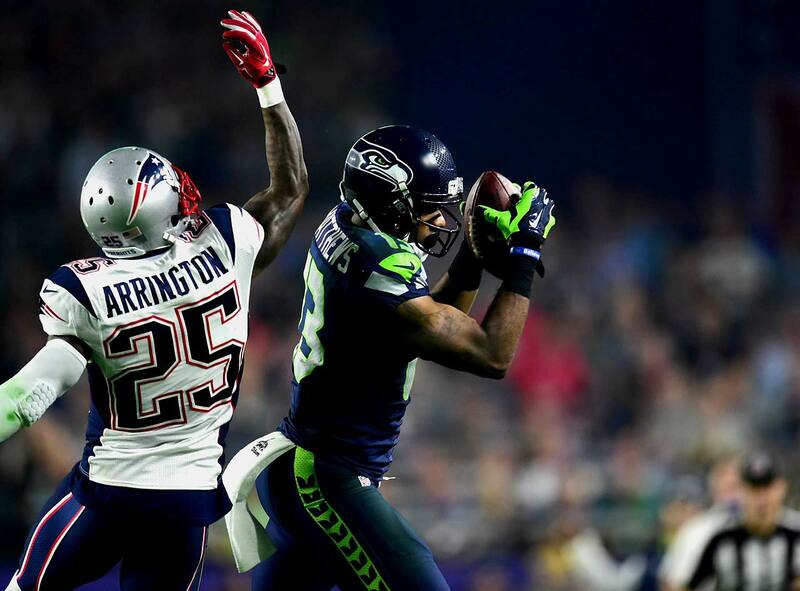 Unheralded Chris Matthews was the star for Seattle, catching four balls for 109 yards and a touchdown at the close of the first half. Matthews hadn't caught an NFL pass before Sunday's game. 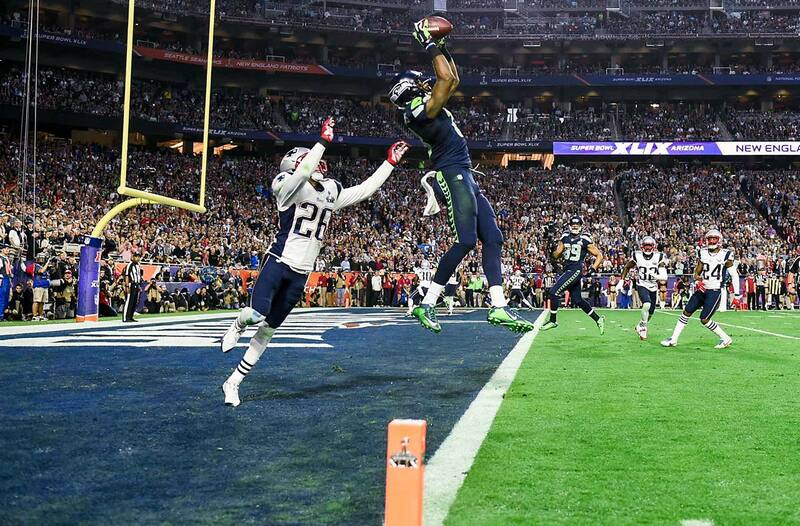 The Seahawks passed up a field-goal attempt with six seconds left before the half and Matthews rewarded them with this scoring catch. 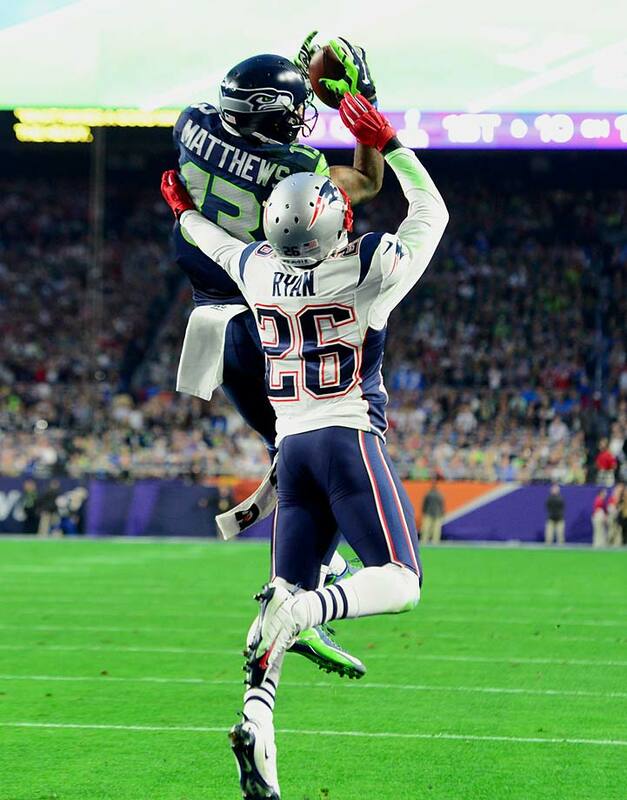 Matthews' catch tied the game at 14-14 at the half. Earlier in the first half Matthews caught a 44-yard pass against Kyle Arrington. 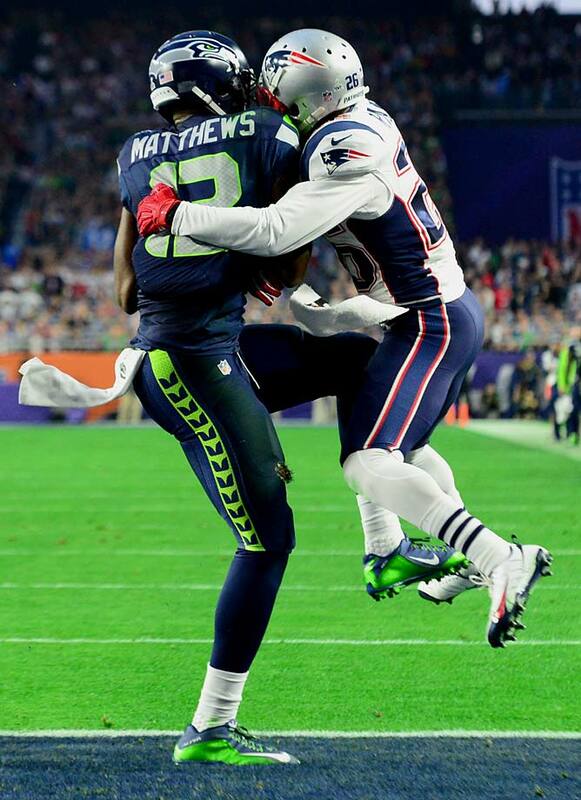 Matthews' catch against Arrington set up a three-yard touchdown run by Marshawn Lynch that made it a 7-7 game. 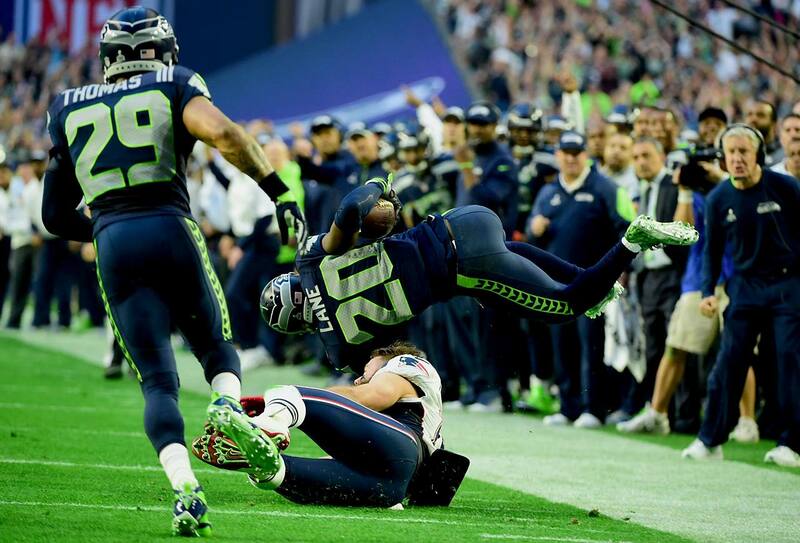 Marshawn Lynch finished with 102 yards on 24 carries and this lone touchdown. 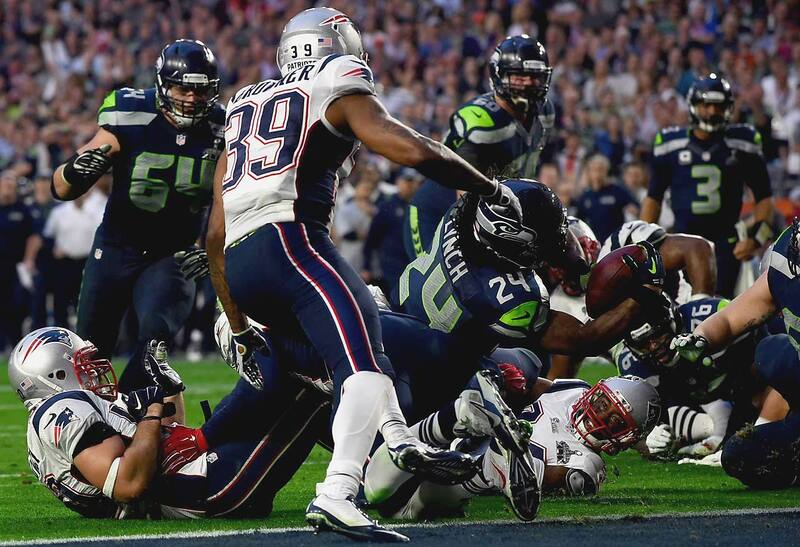 The Seahawks questionable playcalling in the closing minute denied him the chance to score a likely game winner. 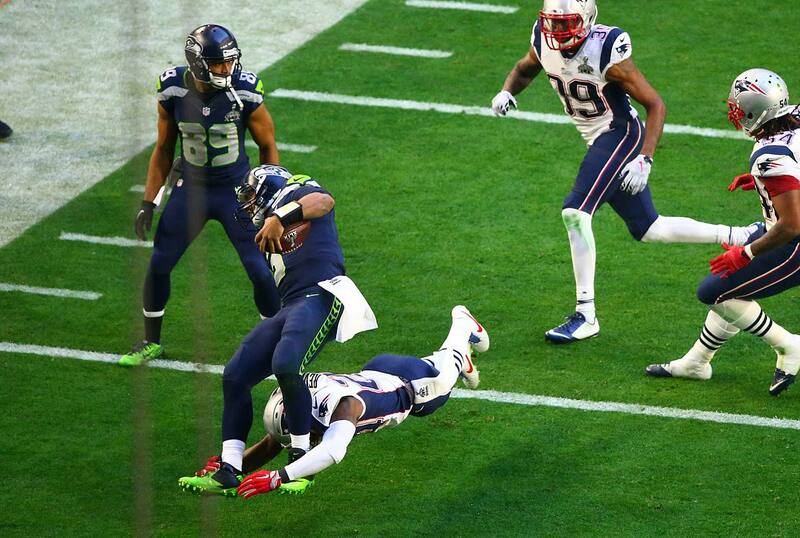 First-year Patriots receiver Brandon LaFell caught one of Tom Brady's four touchdown passes. 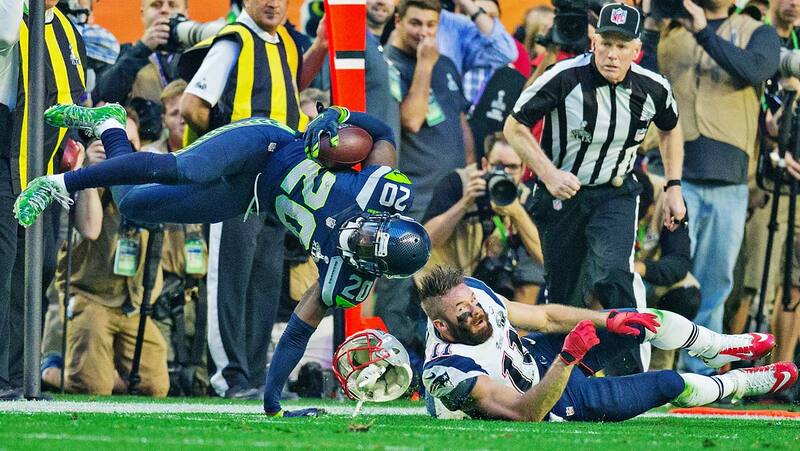 Seattle got a touchdown-saving interception by Jeremy Lane in the first quarter but he left the game after injuring his left forearm on the return. Lane's injury forced Tharold Simon into the game as a replacement and he was the defender on three of the Patriots four touchdown passes. Lane tried to cushion his fall by extending his arm. 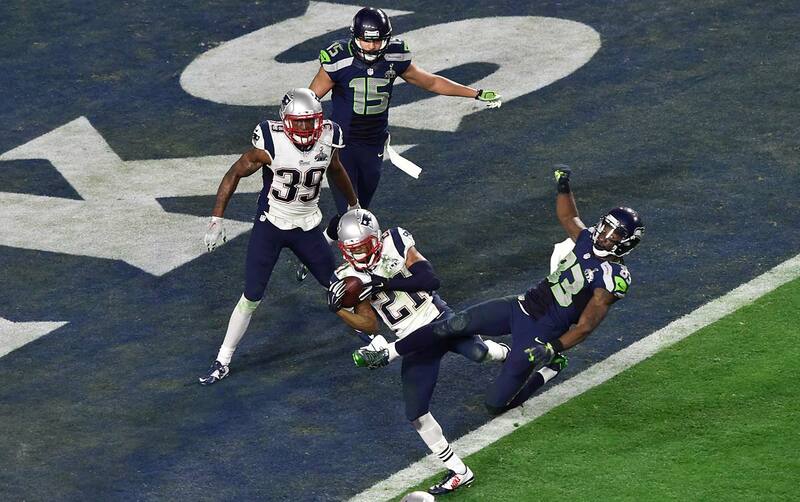 His interception was one of two Seattle came up with against Tom Brady. 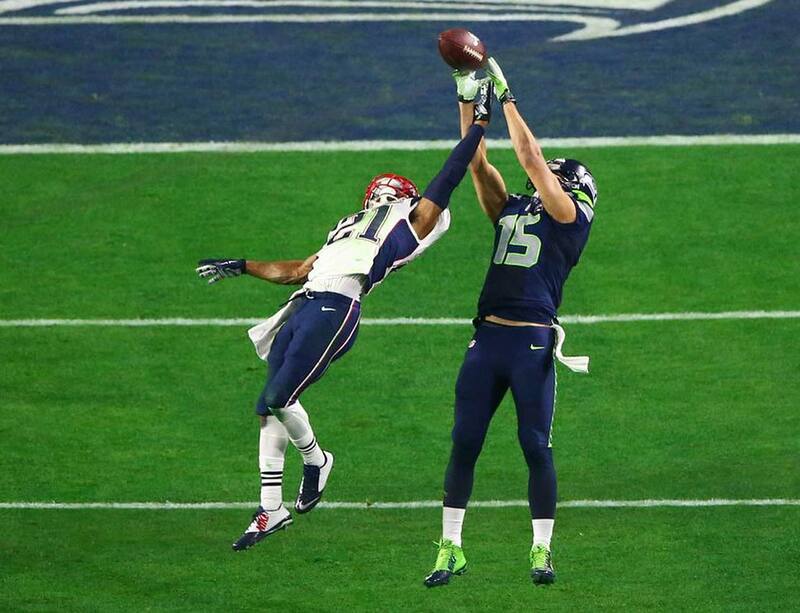 Logan Ryan prevents Jermaine Kearse from catching a pass. 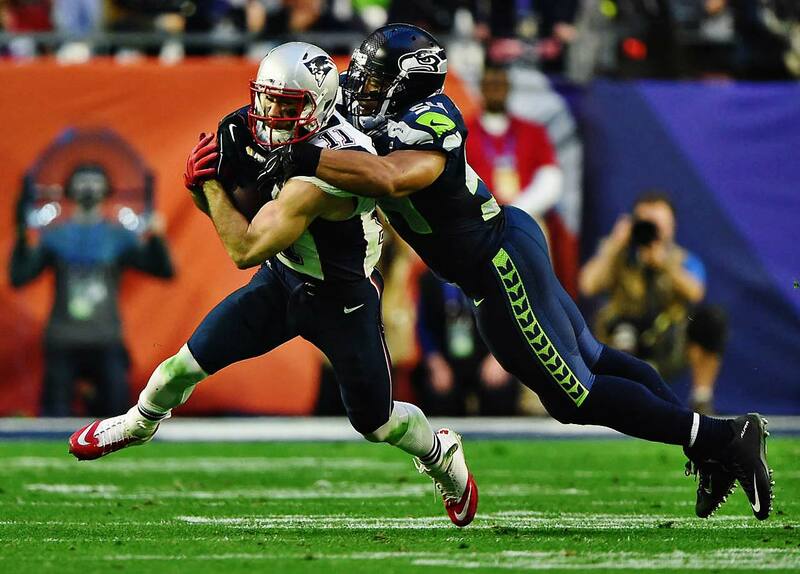 Ryan Allen gets toppled by a Seattle defender on an early punt. 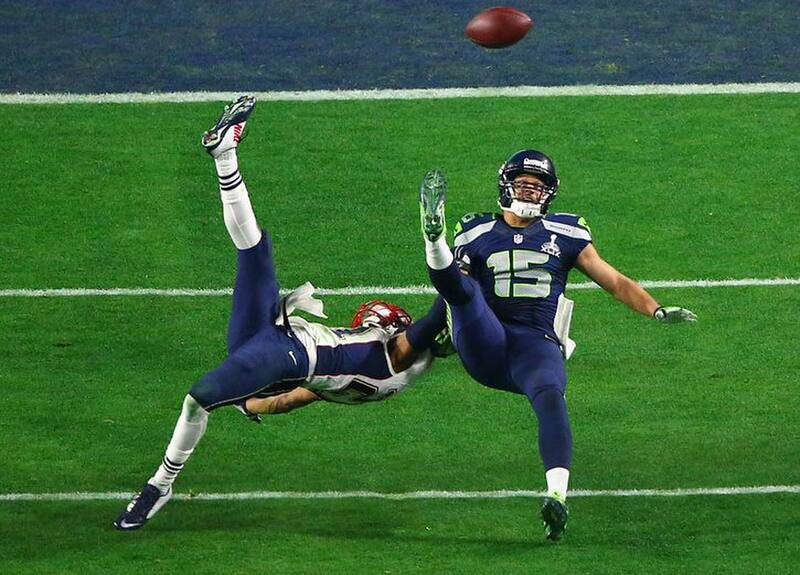 Seattle was flagged for hitting Ryan Allen but it wasn't a 15-yarder and a first down. 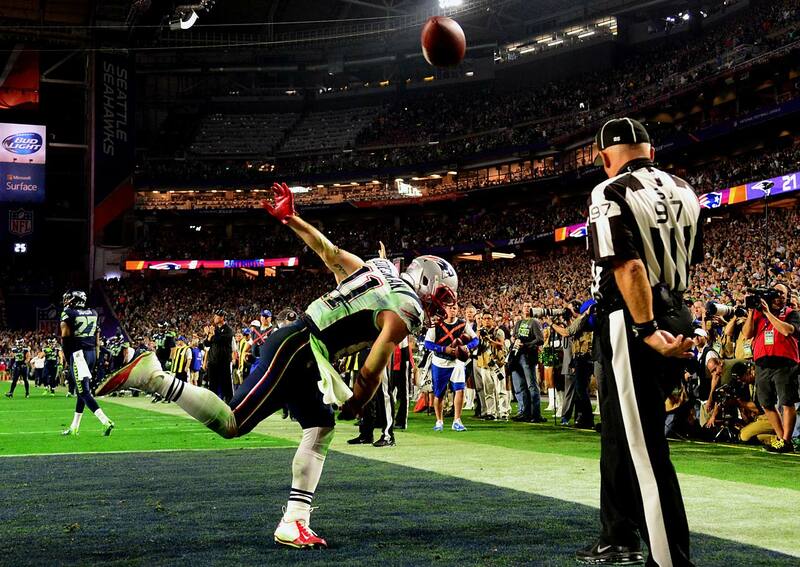 Julian Edelman and the Patriots hurt Seattle with quick, short catches and then yards after the catch. 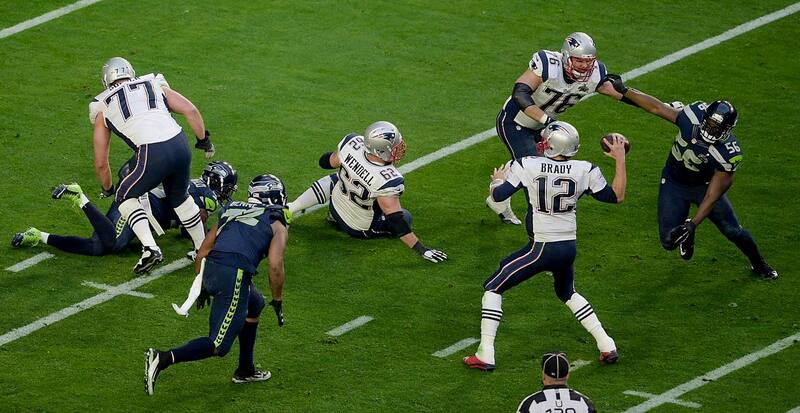 Brady gets rid of the ball before the Seattle defense can reach him. 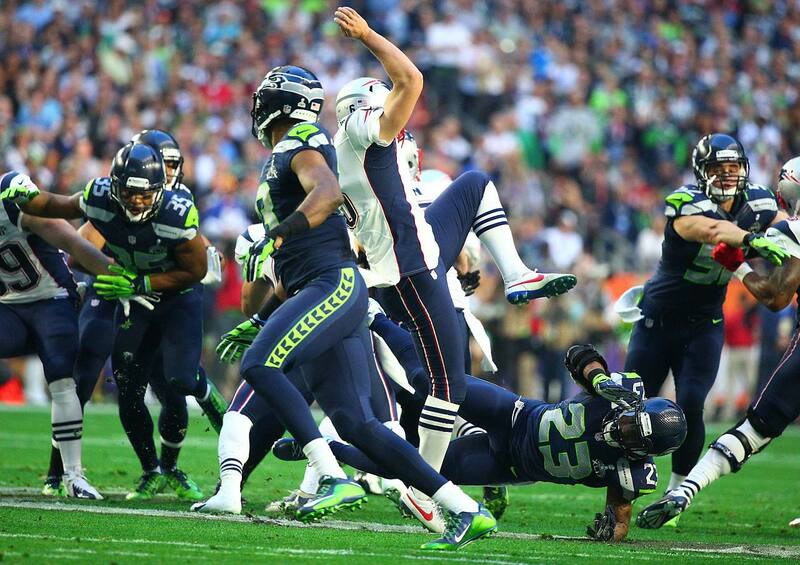 Darrelle Revis tackles a scrambling Russell Wilson. 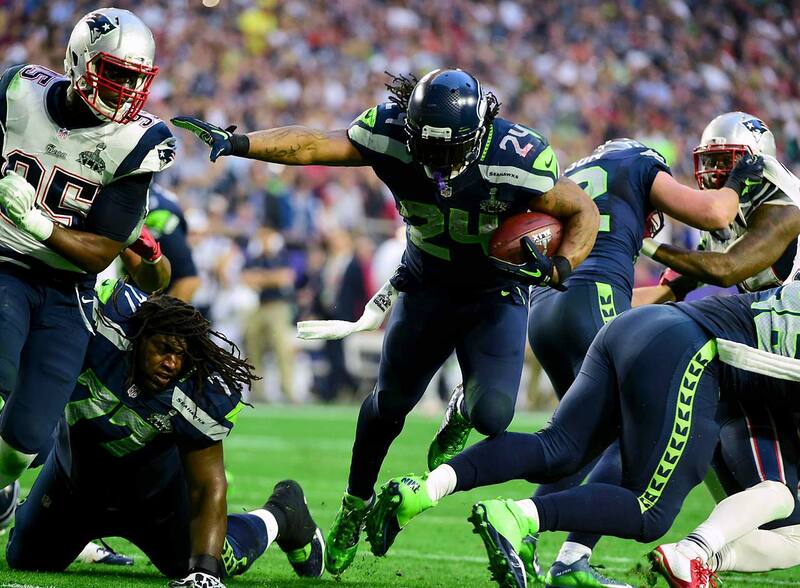 Marshawn Lynch rumbles for yardage against the Patriots. 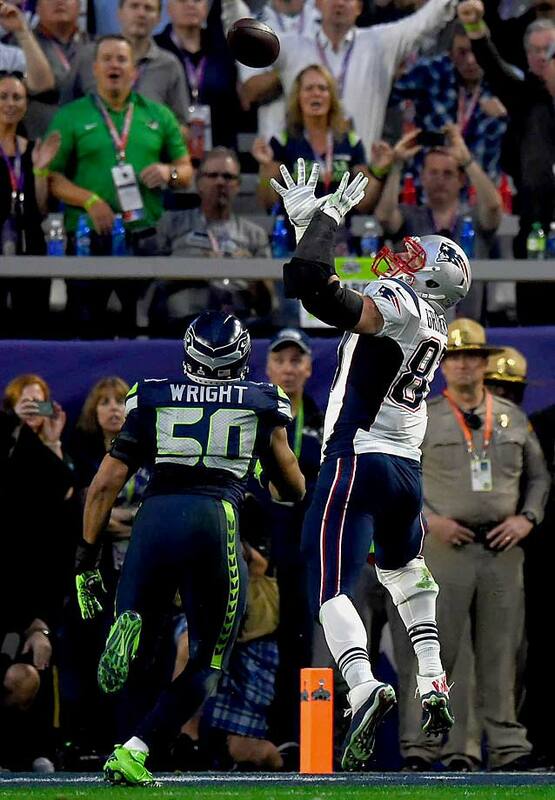 Rob Gronkowski had a touchdown catch among his six receptions for 68 yards. 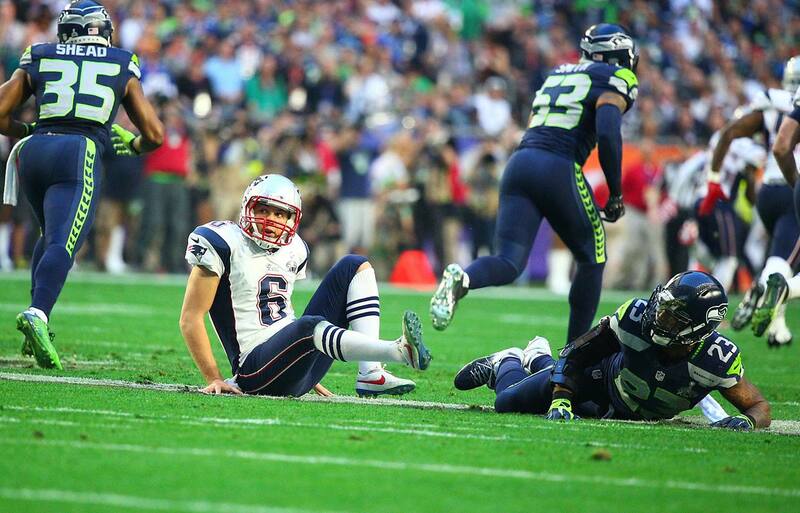 The Patriots had but 13 incompletions among their 50 pass attempts. 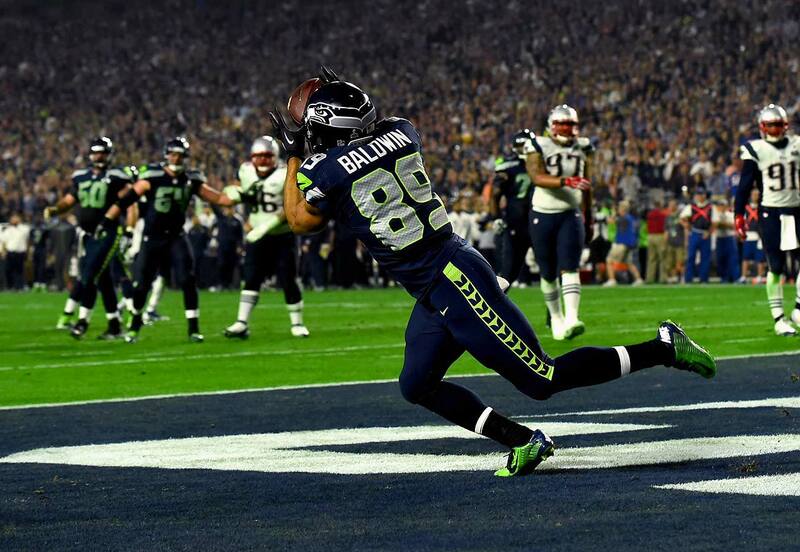 Doug Baldwin's wide open three-yard scoring reception with five minutes left in the third quarter gave Seattle at 24-14 lead. 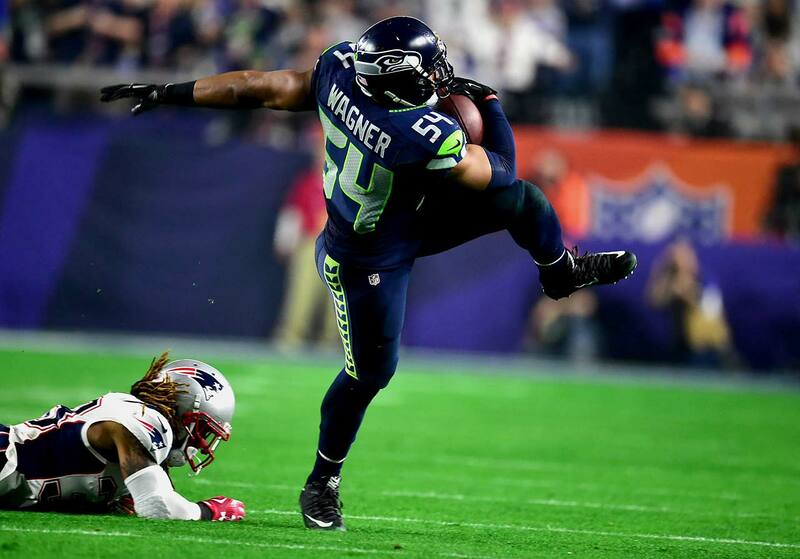 Bobby Wagner had a second-half interception of Tom Brady. 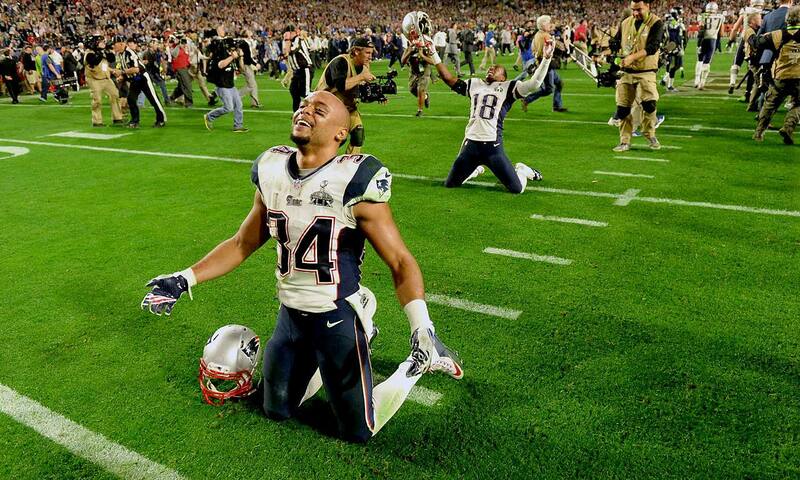 Shane Vereen and the Patriots rejoice over their first Super Bowl win in 10 years. 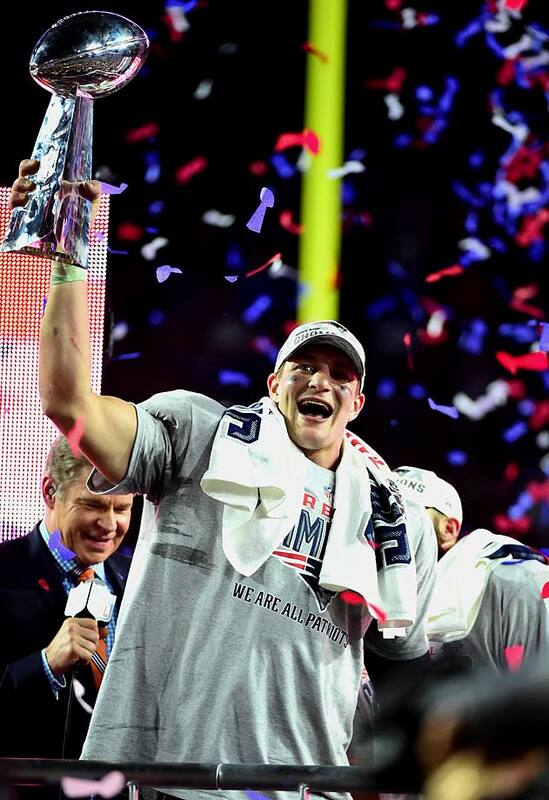 Rob Gronkowski promised to party into the wee hours of the morning. The scoreboard says it all. 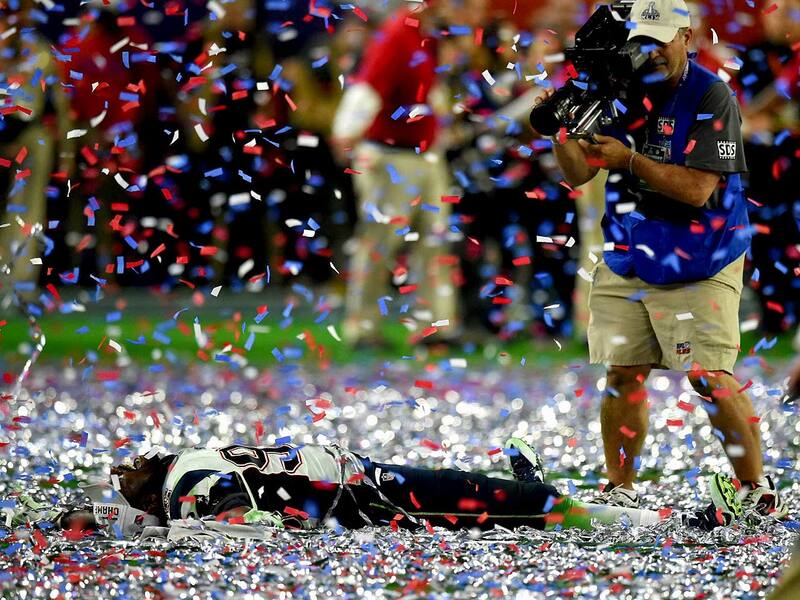 An unidentified Patriot does a confetti angel. 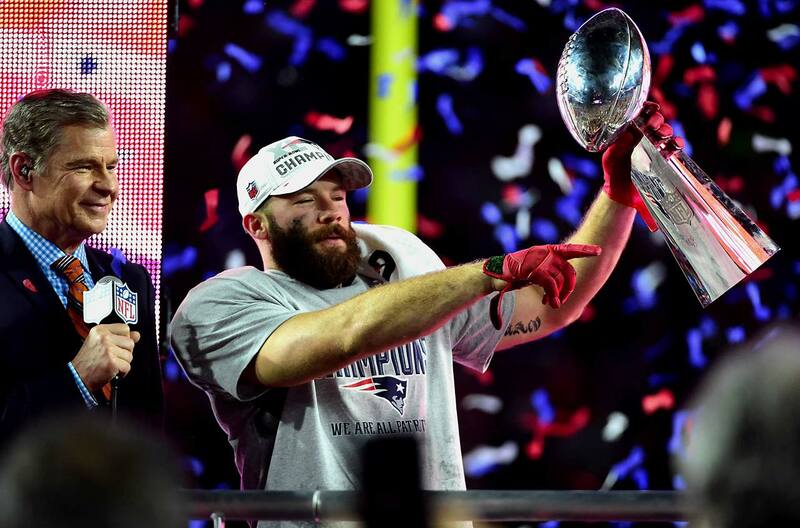 Julian Edelman enjoys his moment in the spotlight. 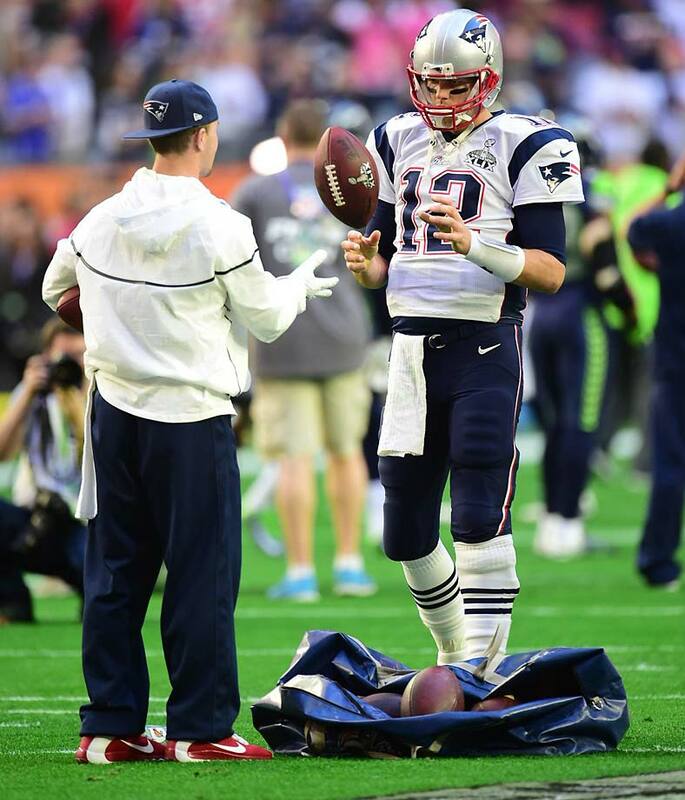 The Patriots entered the game with the Deflategate investigation still ongoing. 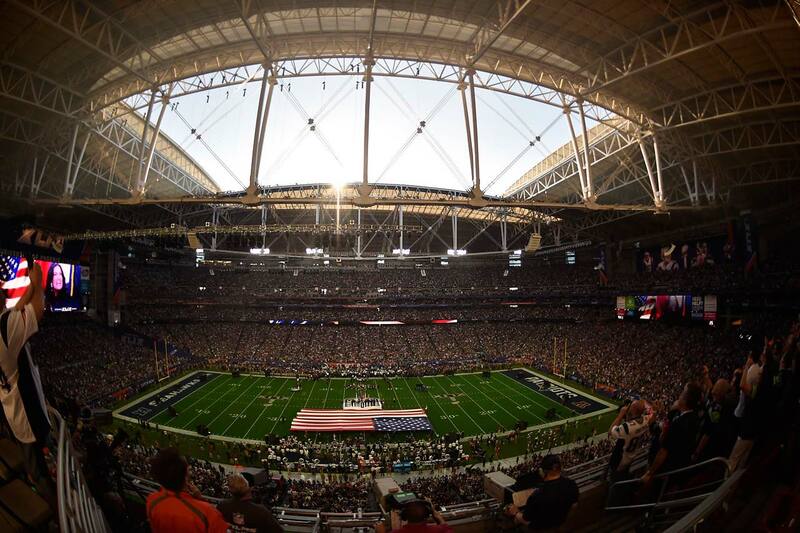 A view of the stadium before the start of the game. 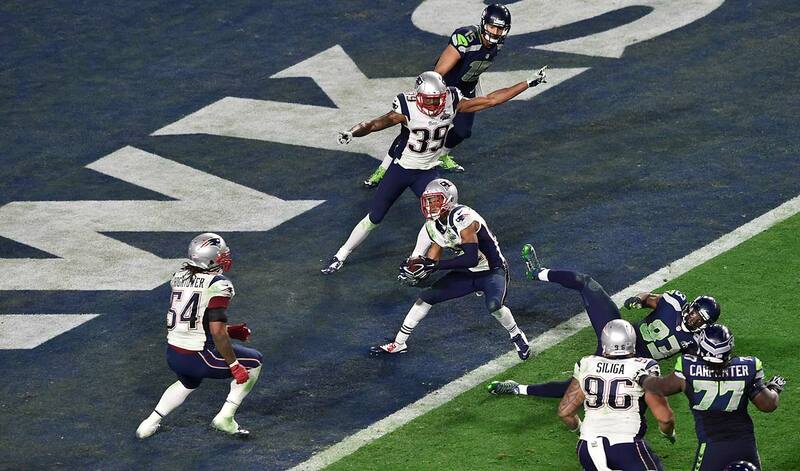 New England placed their goal line defense on the field, so Seattle went to a three-wide receiver formation. 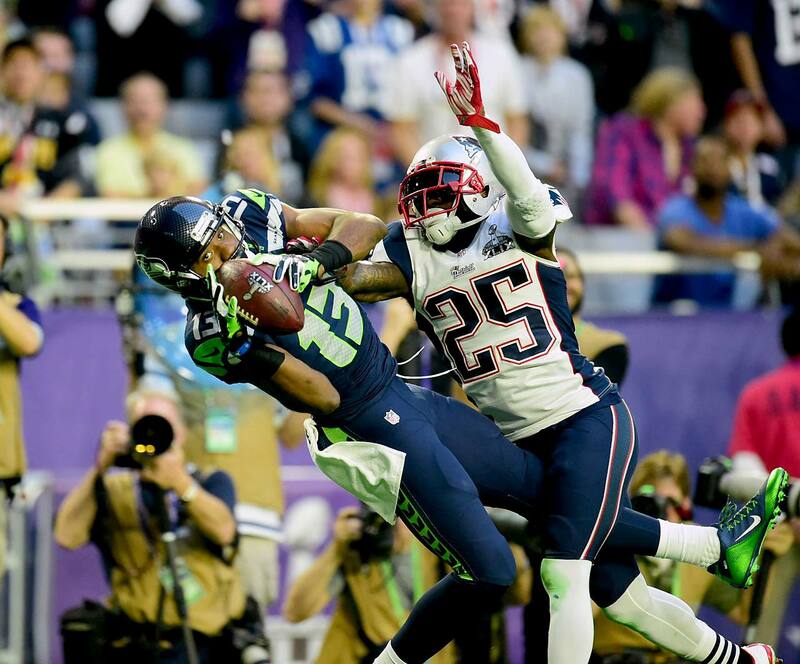 Wilson was intercepted on the next play after the Lynch run by rookie cornerback Malcolm Butler, who was a late substitution. LaFell said that in situations when passing in the red zone, quarterbacks have to throw the ball low. “So when they decided to throw the ball, and when you throw the ball on the end line, you gotta throw it low," LaFell said. "When you throw it high, it's gonna get tipped. ... Nine times out of 10, it's gonna get tipped, and when it's tipped on the goal line, that's a team meeting: Somebody's gonna get it."